Even in the midst of a sub-par season, there were plenty of players who made positive strides. Yesterday, Kyle Gibson was named the team’s most improved player after having the best big-league season of his career. Other impact players included multiple rookies. Today, the Twins Daily 2018 Rookie of the Year winner will be announced. There were 20 rookies who played with the team in 2018. This was up from the 19 rookies to play with the Twins during the 2017 campaign. However, this year’s winner is a player very familiar to those who have followed our minor league coverage over the last handful of years. Garver won the Twins Daily Minor League Hitter of the Year in 2017 and the Twins organization also honored him with the same award. He has been a hitter throughout his time in the minor leagues and his game calling ability has continued to improve. Jason Castro’s injury allowed him to take on a more regular role as the team’s backstop. In April, Garver got the season started off on the right foot. He batted .281/.324/.531 with four extra-base hits through his first 12 games. May was his worst month as he struggled to a .544 OPS with more strikeouts (15) than hits (12). From there, something clicked and Garver became on the team’s most consistent hitters. After hitting .249/.332/.367 in the first half, Garver improved in every category in the second half. He hit .295/.343/.481 with 32 RBI and 16 extra-base hits in the second half. Among Twins players, only Jorge Polanco had more RBI in the second half. Garver was also able to put up these numbers while catching the most games on the team. Garver’s second half wasn’t just one of the best on the Twins. It was very comparable to other MLB catchers. His RBI total ranks his third in baseball behind Salvador Perez and Yadier Molina. His slugging percentage also ranks him third behind Perez and Yasmani Grandal. His weighted runs created (wRC+) was also third among catchers as he trailed Grandal and Omar Narvaez. Even as a right-handed batter, he did most of his damage against right-handed pitching. His OPS was 183 points higher against righties and he got on base over 35% of the time. His strikeout to walk ratio looked better against lefties since he faced them in fewer at-bats. In 107 plate appearances, he posted an 18 to 10 strikeout to walk ratio versus southpaws. When former Twins manager Paul Molitor was asked to evaluate Garver’s rookie season, he said he saw plenty of positive signs this year but there are also areas where Garver continues to improve. Congrats to the Twins Daily Rookie of the Year, Mitch “Garv Sauce” Garver! Jake Cave only played in 90 games for the Twins and still finished eighth on the team in bWAR. He was outstanding in the month of July as he hit .314/.338/.500 with nine extra-base hits in 70 at-bats. Over the season’s final two months, he had 19 extra-base hits including nine home runs. He’s done all of this while getting on base almost 32% of the time. Fernando Romero made his much anticipated debut in 2018 and there were flashes of the kind of pitcher the organization hopes he can be. He made 11 starts for the club from May-July but he would reach his innings limit with the Red Wings and wasn’t called up for September. In his second start, he shut out the Cardinals over six innings and added nine strikeouts. His longest start came in Seattle when he pitched seven innings. He allowed two runs on five hits and struck out seven. How would your ballot look? Leave a COMMENT and start the discussion. No love for Astudillo? For shame. I agree with the rankings. Of course, a shout out to Astudillo. Less than 100 PA but he had an impact with both stats and stature. Finally, a thumbs-up to Kohl Stewart. He improved a lot from his first few appearances to his last. Don't know how good he'll be in the long run but he showed a decent FB and a really nice sinker. I'm going to disagree with the choice for one reason: opportunity. And that's not Garver's fault. As much as we want to blast Molitor and his use of Wilson over Garver, in the long run, it may have been best for his development. Even being a believer in Garver, and supporter of him over the year, I still have to give my rookie vote to Cave. Did he have a few bad plays in the OF? Yes. But those are correctable with time and coaching. He made mkre great plays than bad ones. He provided hitting, power, hustle, and a genuine love for his opportunity and playing the game. He also showed degrees of improvement at the plate as the season wore on. Make no mistake though, I think Garver is a keeper. I don't care he wasn't top HS draft choice who skyrocketed to MLB. He's a catcher...there is a lot to learn...and he's not old. His game calling is solid. His defense has seen real improvement. His bat plays. The article speaks about his bat, and he passes the eye test for me. Castro can be a very nice veteran compliment, decent LH bat with power, quality defense, and mentor. 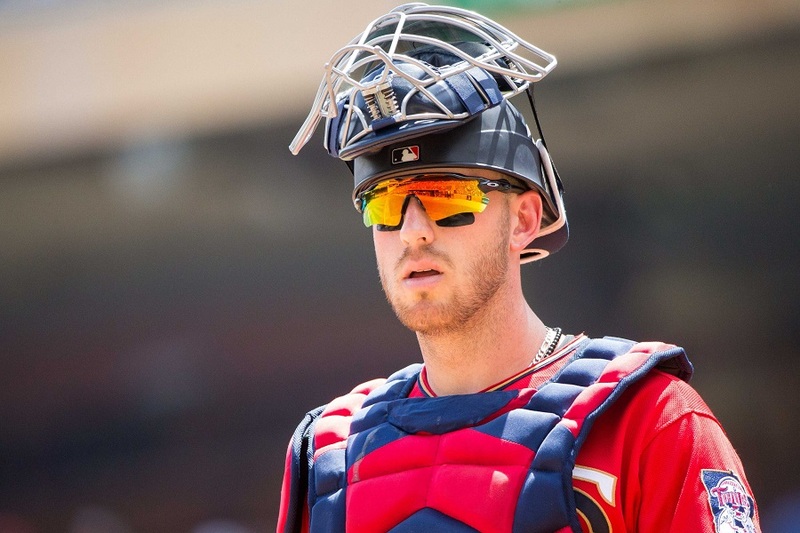 Garver should emerge as our primary catcher for the next few season's, at least, with solid hitting and OB numbers with above average power production for the position. Romero is right at #3, not because of ability, potential, or what he may be as early as 2019, but just because of experience and 2018. We've read who he is and can be. We've seen flashes of what he is and can be. No matter how good Berrios is, and can himself still be, it's very possible Romero could be the Twins best starter by 2020, if not the second half of 2019. And I know the votes only go 3 spots, and with good reason, but I'm going to offer up some love for Astudillo. And not just because he's fun and a feel good story. Honestly, should we be that surprised at what he's done this year, SSS or not? They guy is a CATCHER who can be OK at other positions but is a career .300 hitter in milb. At 26yo, we are not talking an aged journeyman. Since...FINALLY...being given a REAL opportunity and look-see he has built on his reputation and developing power to do nothing but play hard, play well, and hit the damn ball all over the place. 2017 and 2018 results makes the decision to let Stuart Turner go and keep Garver, look prophetic. Turner spent most of 2018 in AAA and was on the DL twice. He hit .218 in AAA on 2 teams and .134 for the Reds in limited appearances. I know nothing about his fielding performance in 2018, which I recognize as being critical at the catcher's position. What an excellent year for Garver. Who would have thought the day Castro was injured that catcher wouldn't be a concern for the Twins this off season?The biggest question for next year is what should the split of playing time be between Garver, Castro (assuming he is healthy), and Astudillo? I think each of 4 rookies, Garver, Cave, Romero, and Astudillo will have chances to makesignificant, positive impact on the Twins in 2019. (I'm not sold on Kohl S. or Stephen G.) I'm glad that 2 rookies are good hitting catchers, a position I was worried about before the 2018 season began. Before the season, we had comments on TD about who was available atcatcher in the event of an injury to Castro. I guess we found out. I was surprised to read 20 rookies and then tried to figure out who they were - I remember the great promise and performance of Romero and only wish we had seen more of him before the end of the season.Garver is a great choice because I almost forgot he still had rookie status. Cave would also have been a really solid choice, but the catcher position is so demanding that it would be hard to give it to an OF when Garver handled so many different pressures. I hope we have a most exciting award because that would be owned by Astudillo. Now as to those other 16 rookies?I know we had a boat load of pitchers in September - is my count right that we had 10 rookie pitchers? A September call up should not be rookie of the year, but Call up of the year should be Stewart who I have to admit I had written off.I did not see him turning it around like he did.Good for him.The relief pitchers that we called up distinguished themselves by mostly being not ready for MLB and at their ages they should be. So who are the remaining 6?Did the come and go that quickly?I just do not remember other rookies at bat.Are Austin and Field rookies? I know his defense is terrible, but I wouldn't mind having both he and Astudillo behind the plate next year.Trade Castro.Bring on the rebuild. I agree with this choice......my concern going forward is the head injury history....does he need to move to 1B/DH more, and catch less? Maybe the OF occasionally? Has he ever played 3B? I think he's a legit decent/good hitter. If he can catch, DH/1B and sometimes OF, he's got real value. Fun topic! I'd give it to Cave. The batting average and RBI were identical to Garver, but Cave hit 6 more HR. Caveman also played very good defense, while Garver....struggled at times. Garver's a nice player. Cave was better. This one's a No. Too many PA in 2017. I had Willians Astudillo as my #3. Astudillo will still have rookie status in 2019. I haven't been this big of a rookie fan since Dink and Chad Allen.I hope Willians pans out to be more than Dink and Allen on the field.Just gotta love the guy. I'm a bigger Cave fan than Garver, but Garver gets my vote. Astudillo will be in the running for 2019 AL Rookie of the Year. On one hand, it's great to see some love for Garver after seeing so many forum posts being down on him throughout the year based on his slow start. On the other hand, if his numbers are the team's RoY, this team is in trouble. Losing to the Yankees in the wild-card game? I see the similarity. I fully expect Romero to be a wipe-out reliever, a rh Andrew Miller, and he will eventually prove to be most valuable of the three, but Garver is pretty decent at the tourghest position, and that is really valuable. Cave is most likely a fourth outfielder. The rankings are fine, but in terms of what they showed in 2018 and how that portends the Twins future, which is what we should really care about, that would be my order. I can't wait for them to just plop Romero in that role.What I think is likely, though, is that they let him go through the starter motions in the spring, send him down for a couple of months until they're safe, then bring him back as a reliever who does not attain a total of one year service time by end of next year.